No matter what you think about the current market dynamics, one thing is becoming increasingly clear: Free agency is leaving more and more players at best annoyed, and at worst pissed off. Many free agents are signed, of course, and some of them are signed to big, healthy contracts, but other premium players are still without employers, and the messaging has hardly been subtle. Players and the union aren’t pleased. Even if the team side of the equation isn’t doing anything wrong, the state of things is far from harmonious. A greater number of players are talking about what they see as a problem. Imagine yourself, then, as a player who’s not yet a free agent. You might be inclined to believe you’re exceptional. Maybe you figure things’ll be worked out by the time it’s your turn. But you keep hearing about how free agency isn’t what it used to be. Even if most of the money is still there, nothing happens fast. There’s a lot of uncertainty. The idea of reaching free agency has been somewhat devalued. At least in theory, you’d figure this could lead to an increase in the number of long-term contract extensions. It’s too early to know if there’s a trend. And no player is going to come out and say “I signed this extension because free agency is bad now.” But Aaron Nola has become the latest player to give up a free-agent year or two. Not for free, obviously. He’s going to get paid. It’s a question of whether he’ll get paid enough. It’s getting harder to calculate what “enough” even is. The guarantee here is $45 million over four years. It could become $56.75 million over five years. For the Phillies, that final option year will effectively be an $11.75-million decision. Sometimes contract extensions can feel somewhat ordinary, especially around this time on the calendar. But there haven’t been that many three-year starting pitchers who’ve given up future years of free agency. Chase Anderson gave up one free-agent year. Carlos Martinez gave up four. Wade Miley gave up one. And then you have to go all the way back to Johnny Cueto, in 2011. Almost for lack of better options, I suppose Martinez makes for the appropriate comparison. By any number, Nola looks better. Martinez was good, but Nola looks better. 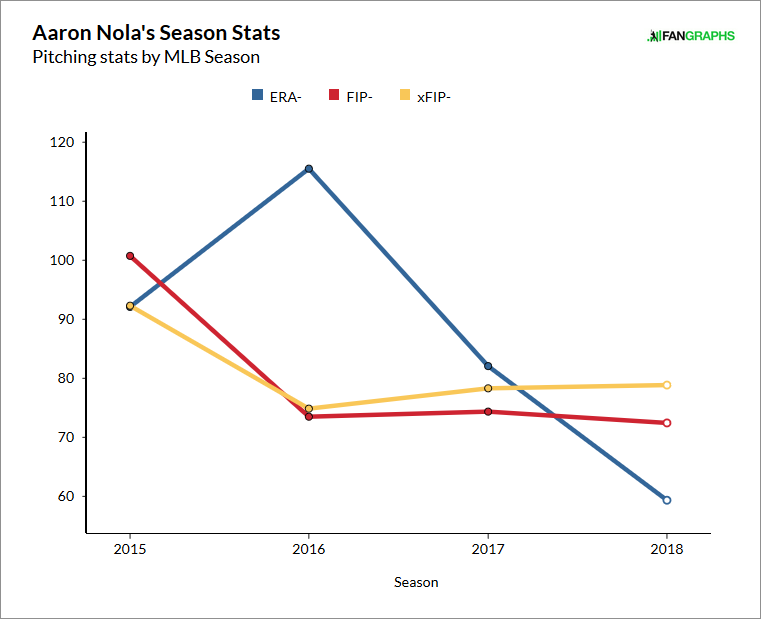 In fairness, this does ignore that Nola had an elbow scare back in 2016. But, for two years, he’s pitched without problem. It’s true that Martinez threw and throws harder, but Nola has converted his own stuff into superior results. He just finished third in voting for the NL Cy Young. For what it’s worth, Martinez had received a $1.5-million signing bonus when he first joined the Cardinals. In his first year of arbitration, he was going to make a minimum of $3.9 million. Nola received a $3.3-million signing bonus when he first joined the Phillies. In his first year of arbitration, he was going to make a minimum of $4.5 million. With these numbers in mind, both pitchers were guaranteed to be millionaires. Nola was maybe less incentivized to sign for a big-dollar compromise. His dollars ultimately aren’t that much bigger than Martinez’s. The only part meaningfully more player-friendly is that Martinez signed away two extra years. Nola will still be eligible to hit free agency sooner, if that’s what he wants. 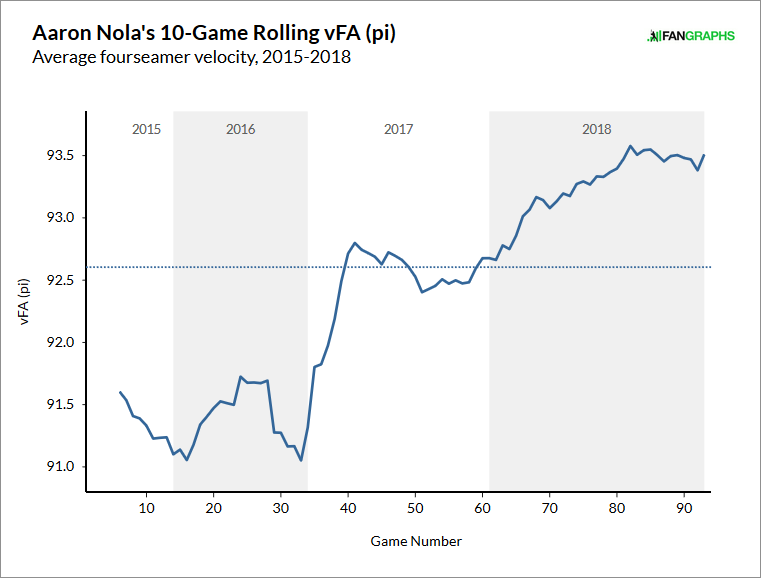 There’s no hiding the fact that Nola has been throwing harder. Throwing harder is good. Nola, also, has been working into a greater number of pitcher-friendly counts. In 2016, he ranked in the 42nd percentile, throwing 61% first-pitch strikes. In 2018, he ranked in the 98th percentile, throwing 69% first-pitch strikes. Even as the peripheral numbers have hardly budged, we’ve seen Nola throw harder, stay healthy, and get ahead more often. This past season saw him put the injuries at least temporarily behind him, reducing the risk for the Phillies to make a long-term investment. The Phillies can feel very good about this. In truth, Nola can also feel very good about this, because it’s a guaranteed $45 million, but you wonder how much the free-agency conditions factored in. It could be that Nola just really likes Philadelphia. But the last thing the free-agent market needs is even fewer players reaching it in their prime. At least by this measure, the defense behind Nola was fine. He did, after all, finish with a career-low .251 BABIP. If the defense hurt, it really hurt guys like Neris, Pivetta, and Velasquez. This is a simple point, but a fundamental one: Defense can vary. A good defense isn’t consistently, equivalently good; a bad defense isn’t consistently, equivalently bad. If you were to replay the 2018 season a hundred times, then in many of those times, the defense behind Nola would’ve been worse. In the actual 2018 season, you could say Nola got lucky. He got lucky, while he also pitched like an ace. Anyway, we’re all sitting here, waiting for the Phillies to make that one last splash. Maybe there’ll be a splash and maybe there won’t, but the offseason — if this is still the offseason — has already been incredibly productive. Aaron Nola was already going to be a Phillie. He was already going to be the best starter on the Phillies. But now they’ve got him for an extra year or two, at what seems to be a modest price. It’s good for all parties directly involved, while hinting at a larger issue with the sport. We hoped you liked reading Aaron Nola Took the Guaranteed Money by Jeff Sullivan! I don’t think Nola is getting invited to the Verlander thanksgiving anytime soon. Wait did I miss something?